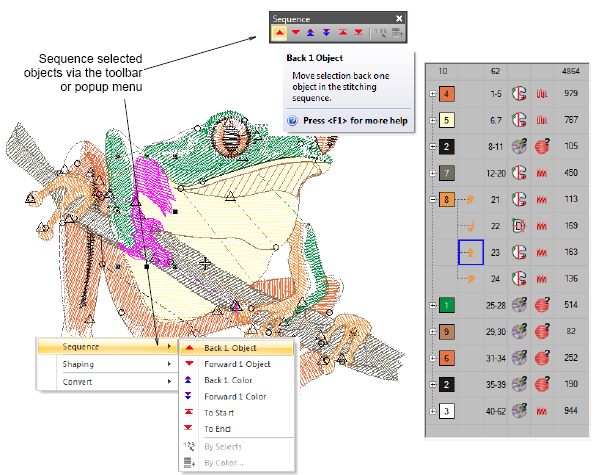 Another review of the Wilcom EmbroideryStudio e3. This one is from Evan West at Wild West Designs…. What do you think about the new e3 software? I’m loving the software, works really well with my Barudans (even have one with a sequin dispenser on it). I know my digitizing customers like the quality that I’m able to produce with the software as well. Keep it up. How long have you been using Wilcom software? I would say about 7 years of my 15 years in this industry, but not straight through. The first place I worked for had your software. When I branched out on my own, I tried other digitizing software and eventually came back to the Wilcom fold. Over the years, I’ve used Wings Modular, MasterWorks, PE-Designs. What do you like about e3? There are a few things that I like about the software that need special mention. The control that the user has from being able to manually input everything (I used to manually input that double slanted zig-zag that is now automated in E3) to being able to control other production machines not just embroidery machines, the direct interfacing with Draw and just in general the “sophistication” of how the entire package is put together. Some of the other programs appear to be “clunky” in how everything is put together. They have the features there, but it’s just not put together in an appealing and efficient manner (at least to me anyway). All in all, I really like the program and currently enjoying the end of the first full week with E3. The Break Apart Lettering tool is a massive time saverwhen your customers logos are made up of lettering with different colors or shapes.Object properties can be edited separately for single lines, single words, or even single characters. The best part is that even when you break the lettering objects apart, they remain as editable text with the stitching sequence maintained. 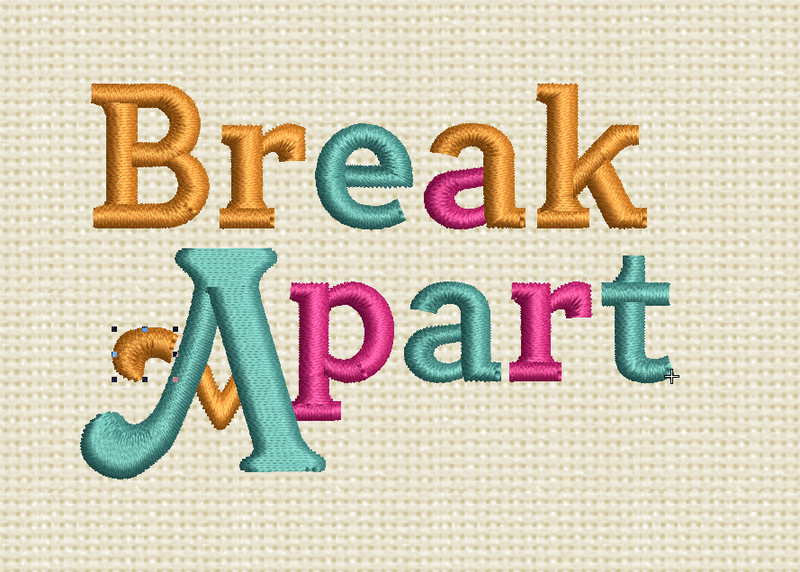 Use Arrange > Break Apart to split composite objects – monograms, appliqués, lettering, etc – into component objects. 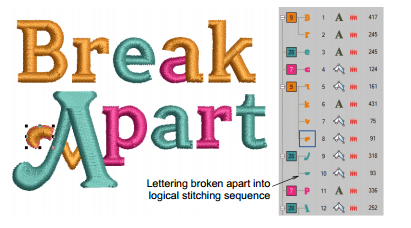 Applying the Break Apart function to a lettering object breaks it into a logical stitching sequence while maintaining lettering object characteristics. Object properties can be edited separately for single lines, single words, or even single characters. Stitching sequence is maintained. Words can be broken into separate objects per letter. 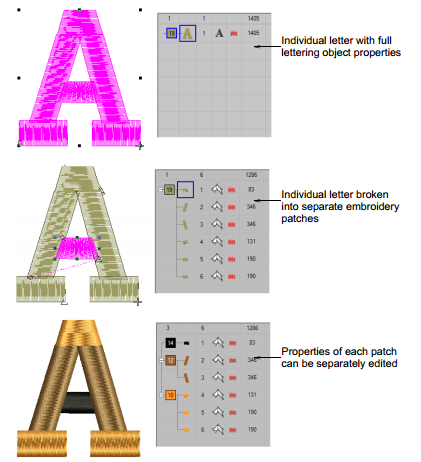 Letters can be broken into their individual embroidery patches. Lettering properties are lost but properties of each patch can be individually modified. An exception for single-line (multi-word) objects is the case of the center-out stitching sequence. Such objects are broken apart directly into single-letter objects. The stitching sequence is thereby preserved. If this is something that would save you time, consider getting Wilcom EmbroideryStudio e3 Designing today! In this article I aim to give an overview of industrial embroidery and hope to demystify some of the processes involved. As with any design production there is an art to it but it is not a black art: it is easily learned, produces high quality results and might just provide your business with that extra stream of revenue that it needs. But first let us begin with what embroidery is. The verb embroider has two senses: (1) to decorate with needlework, and (2) to add details to. In both instances to embroider is to ‘embellish’. This is the bit we are interested in, for ‘to embellish’ is clearly an activity of adding value to something. The use of embroidery for decoration and branding is now commonplace in our homes, our places of work and on the high street. Widely used on clothing, accessories and textiles for interiors it has become an integral part of our visual world. 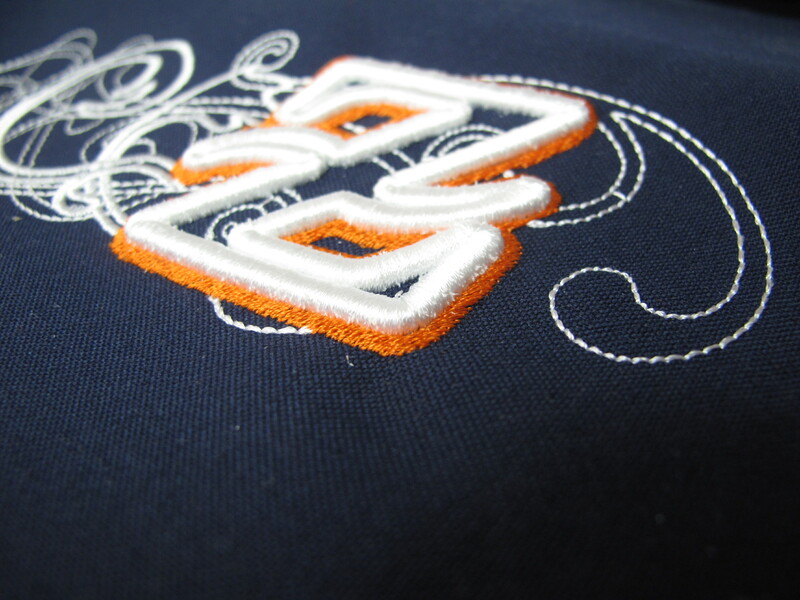 When compared with print, embroidery is more three dimensional; offering high lustre and/or textured effects. It is associated with quality, adding value to a product in both the visual and tactile fields of consumer appreciation. 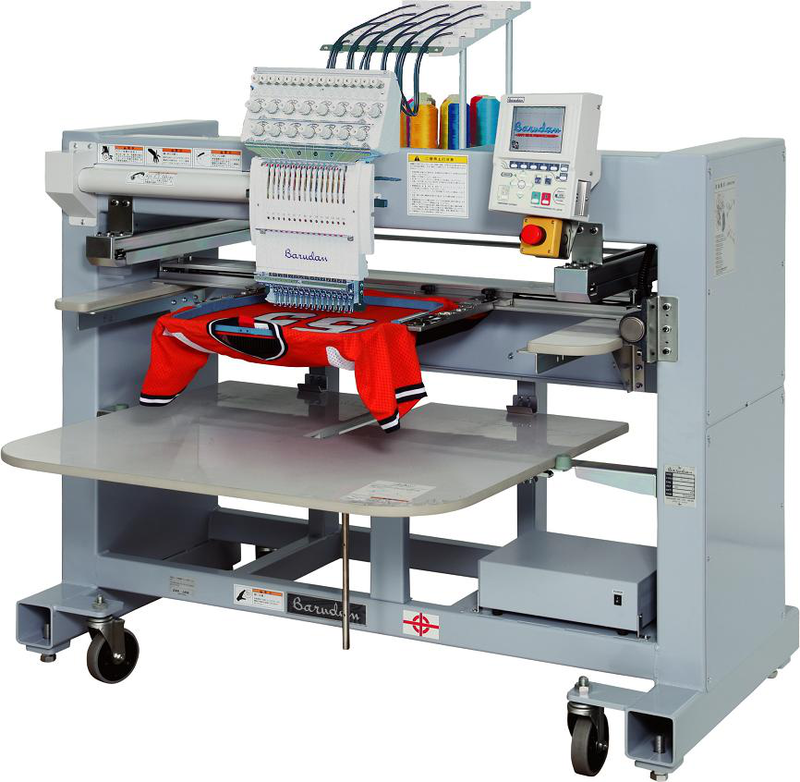 The embroidery we see today is largely produced on computer controlled embroidery machines. 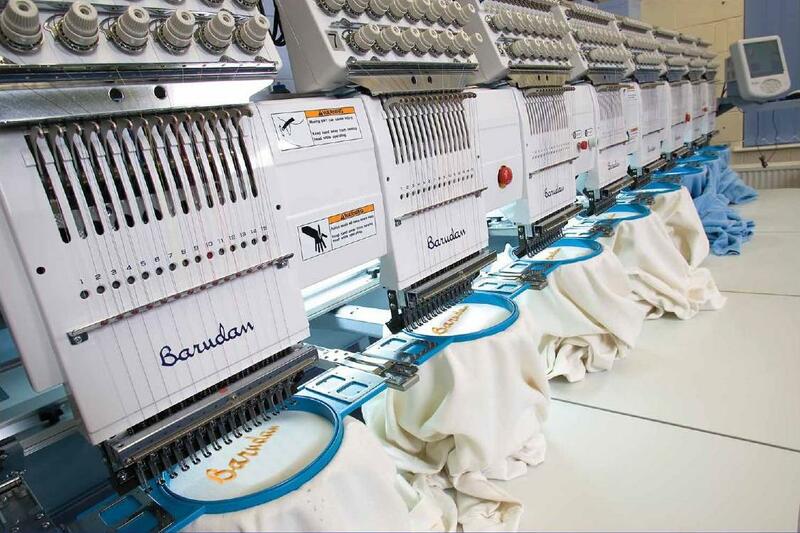 They are specially engineered machines that have a multi-needle fixed ‘embroidery head’ and a frame holder that moves the framed product (for example a garment like a Tshirt) in either of two directions so that the embroidery design can be sewn. The frame holder is known as a pantograph; think of it as a graph plotter because it moves to (plots) the exact location (co-ordinates) of the design expressed in x and y values. The design is created within a grid (known as a ‘field’) with x being the horizontal axis and y the vertical axis. Therefore any point on the design can be identified in values of x and y, a co-ordinate in this field would be written, for example, as x249,y786. The embroidery machine reads these co-ordinates from the design data file and moves its pantograph into position to receive each new stitch from the machines’ stationary needle head. 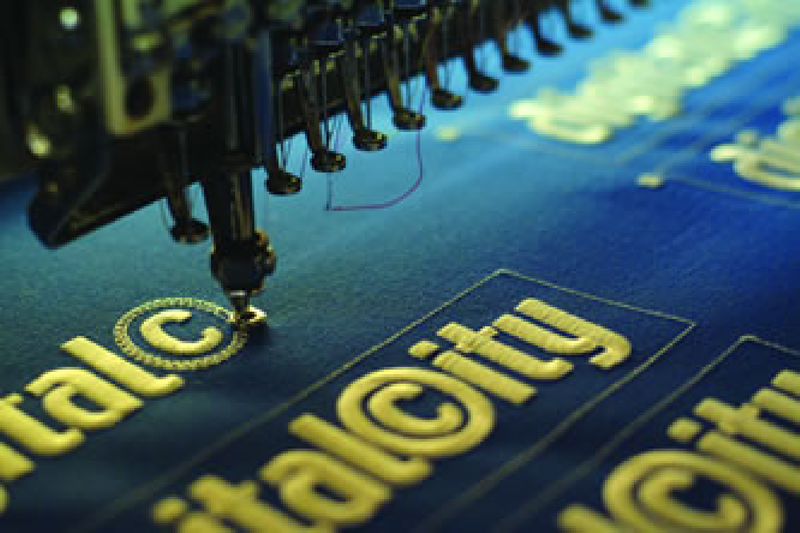 The embroidery design is created on a computer using specialised ‘digitising’ software. Artwork is interpreted in stitches by plotting a route that the embroidery machine needle/s will take when stitching the design and applying machine functions like colour changes. 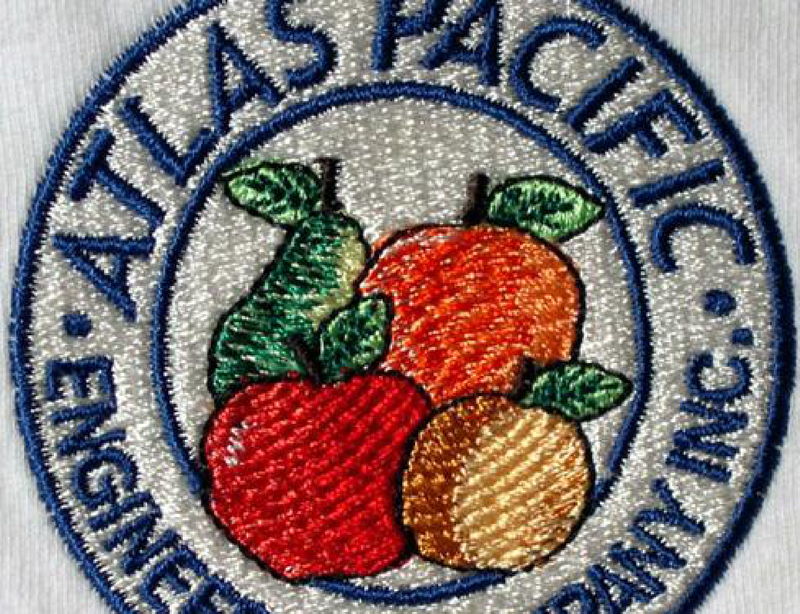 When complete the design is transferred to the embroidery machine in a specific ‘stitch file’ format or language. Once the design is in the memory of the embroidery machine, the operator teaches the embroidery machine how to sew the design i.e. which needles to use for which colour and then starts the machine embroidering. Frame or hoop the fabric you wish to embroider on and slot into the machine arms. Start the machine stitching and run until embroidery design is complete and finished. 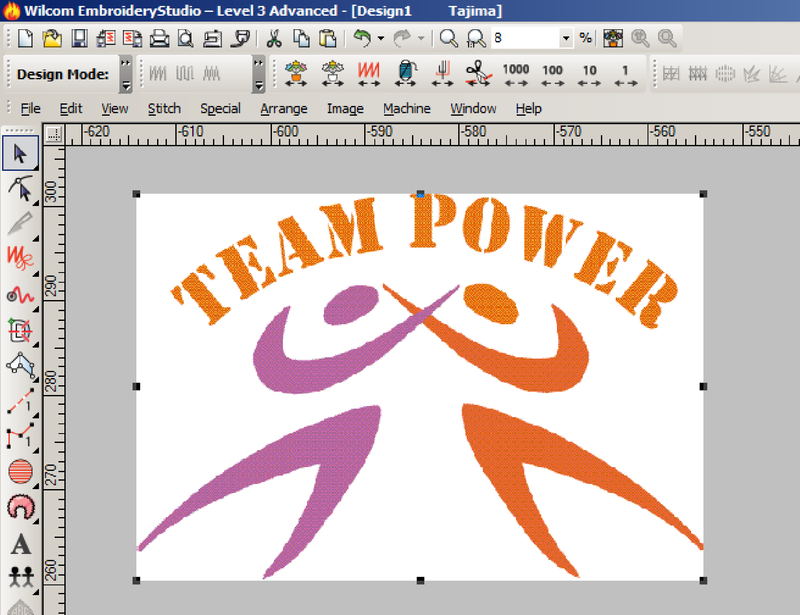 Artwork may exist as a printed document or in a digital form like an EPS or bitmap file (files ending in .eps or .bmp). The design would be either scanned or opened into the specialised digitizing software and displayed on screen. Older systems require the artwork to be enlarged and plotted on a tablet, but modern systems use ‘on screen’ digitizing methods. 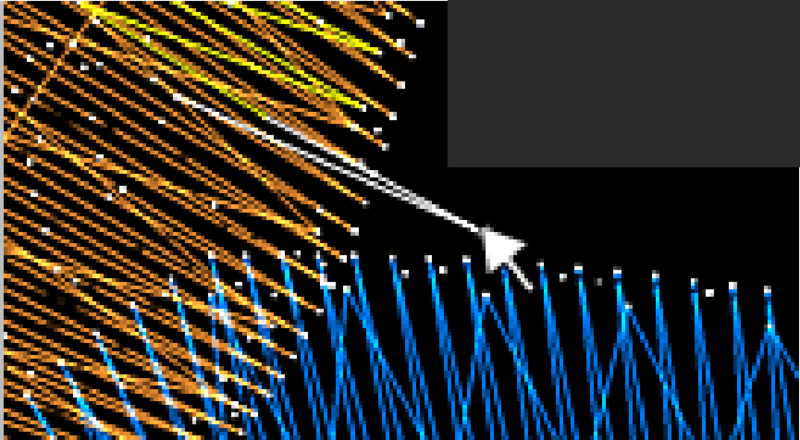 The operator can zoom in and use the pointer of the mouse to define the design in stitches. The process of interpreting the artwork in stitches is both a technical and creative process. Technical requirements would consider the type of fabric to be embroidered on, the scale of the design and the number of needles/colours the embroidery machine can accommodate. Because fabric is not ridged, it will move about when being embroidered upon. When digitising a design an operator will try to both reduce and anticipate the amount of movement, so that the design looks ‘as intended’ when sewn. Some fabric types move more than others especially those that have stretch properties, and some have a surface pile like towelling which can also present technical challenges. The sequence in which a design is created is also very important to reduce fabric movement. As a general rule larger areas of stitches will move the fabric (and hence the design) more than smaller ones. A large block of stitches will tend to pull the fabric together in that area. The operator will also need to consider the number of stitches created and how often the machine slows and/or stops to perform a function like a trim or a colour change, as all these elements affect the length of time a design will take to produce and impact on machine productivity and ultimately the total cost of producing the embroidery design. The creative process is the interpretation of the design in stitches. It is true to say that there is rarely a definitive way to interpret artwork in stitches. Even two experienced operators, or ‘digitisers’ as they are known, will not produce identical results when digitising the same moderately complex design. There are certain aesthetic and technical conventions but beyond these the operator is free to choose from a palette of stitch types to create the embroidery design. Although each block of stitches is essentially a grouping of x and y values these numbers are hidden from the digitiser and the interface with the software involves working with shapes. The software automatically fills in the x and y values in the background. The digitiser will create blocks using different stitch types, different angles of stitching and changes of colour. The stitches in the design will normally be created in the order in which they will be embroidered on the machine. So, for example, if the design has a background fill with detail on top, the background would be created first and then the detail added. The digitiser constructs the design as a series of stitching actions punctuated by colour changes e.g. the background fill (colour a) followed by the surface detail (colour b) followed by additional detail (colour c) etc. Digitising software has experienced major developments in the last 10 – 15 years; parts of the process have been automated, digitisers now have more creative tools to create and edit stitches than ever before, but fundamentally the process is the same. 2. Save the design as a stitch file that can be understood by the embroidery machine. Once the embroidery design is complete the design is saved in the internal file format of the specialist embroidery software, an example of this would be Wilcoms native ‘emb’ file (filenames ending .emb). This is important if the design needs to be changed or edited later as working with a native file makes this easier. What makes the process slightly more complicated is that embroidery design software and embroidery machines don’t speak the same language i.e. they have different file name endings. However it is a simple matter to address. The operator now needs to create copy of this file in a format or language the embroidery machine can read and understand. Each embroidery machine manufacturer has developed their own embroidery file format so there is no single industry standard. However, all the files contain stitch movement co-ordinates and machine functions and are supported for output in the digitising software. As an example a Barudan machine requires a ‘DSB’ file, and a Tajima machine requires a ‘DST’ file. The DSB or DST file needs to be transferred into the memory of the embroidery machine, this might be done via a cable from the PC running specialist software, or via a flash card or USB stick. 5. Frame or hoop the fabric you wish to embroider on and slot into the machine arms. The frame or hoop is based on a traditional embroidery ring; the fabric to be embroidered is secured in the frame rather like the skin on a drum. The purpose of this is to secure the fabric in a mechanism that can be slotted onto the embroidery machine so that it can be moved about accurately by the embroidery machine pantograph. Framing also serves to stabilise the fabric, to avoid the movement of the design whilst being stitched as described above. Further support is added by applying backing to the fabric which is a paper-like product inserted under the fabric and is often also framed with it. 6. 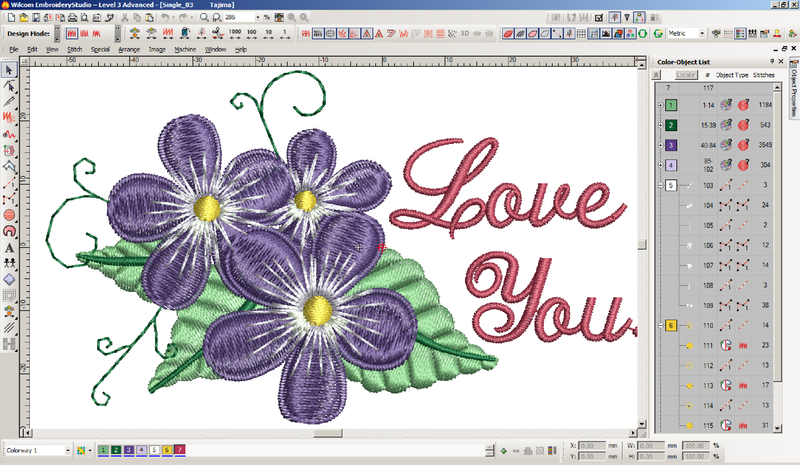 Start the machine stitching, run until embroidery design is complete and finished. Embroidery machines use the conventional ‘lock stitch’ mechanism, using a top thread and a bottom ‘bobbin’ thread to create a stitch. The bobbin, located beneath the material being stitched, catches the thread of the penetrating needle and carries it in a circular direction creating a loop through which the bobbin thread passes locking the stitch to the back of the material. Unlike a conventional sewing machine the computerised embroidery machine is driven automatically moving in any direction within a specified field, changing needles (colour), trimming thread and stitching at speeds of up to 1200 stitches per minute. It also has a more complex tension mechanism which can be key to the productivity of the machine and the finished quality of the embroidery. A well maintained embroidery machine, using good quality threads and stitching a professionally digitised design can complete an embroidery design independently without stopping and requiring operator intervention. 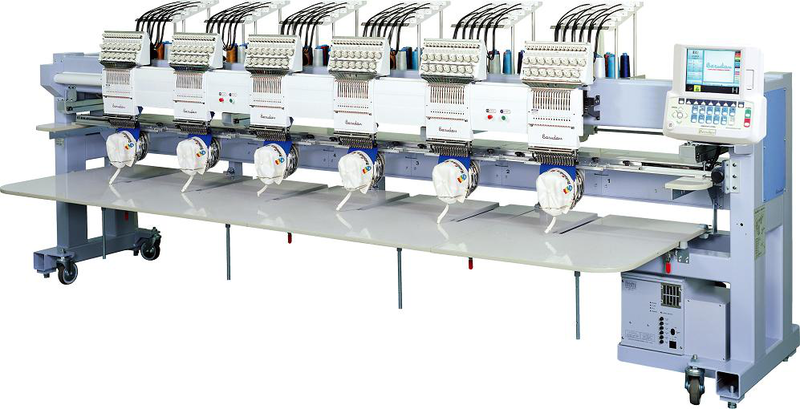 Embroidery machines are available with single or multiple heads; small and medium enterprises will normally operate machines with 1, 2, 4 or 8 heads whilst large companies may use machines with up to 38 heads. Each head produces one embroidery design and all the heads are normally working at the same time. Each head will have a specific number of needles up to 15, machines with either 9 or 15 needles being the norm. Each needle represents an individual colour in the design. If the head has 15 needles and the design requires 16 colours the operator will be required to rethread one of the existing needles with the 16th thread colour. This would not normally be acceptable in a commercial production environment as rethreading for each design produced would represent significant machine down time. The embroidery process is quite complex, from design interpretation, to the production requirements of embroidery machines but the results can be very satisfying, can add significant value, and cannot be achieved in any other way. I decided to write this blog as a response to many inquiries from Wilcom users who wanted to use our products in a Mac environment. I have worked for many years on both environments (Windows and Mac), and I have used Boot Camp and virtualization products on my Mac since 2008; all I have to say is that I don’t regret investing in the software or in the time that I’ve spent testing it, having the ability to have the best of both worlds in my laptop has been precious to me. 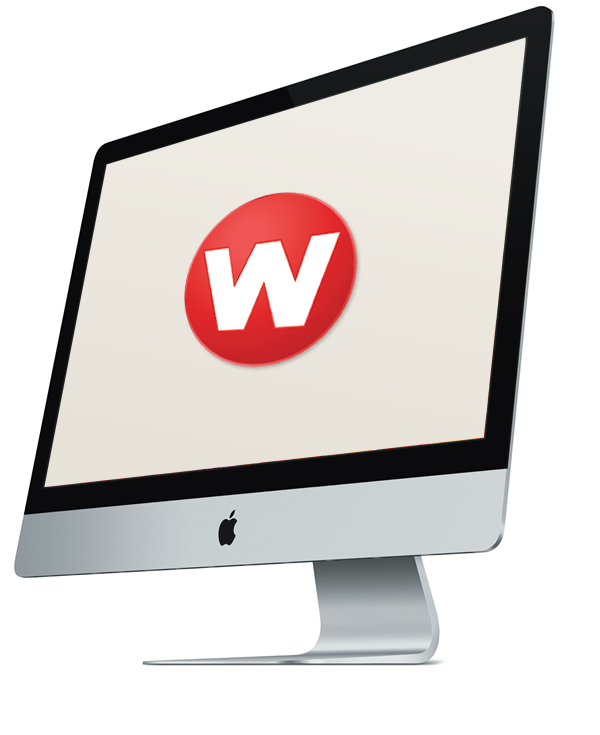 I will recommend using this technology without any hesitation to any Wilcom user who wanted to move to a Mac and keep their Wilcom software, or to any Mac user who wanted to have the best embroidery software. First I need to say that this blog is not a technical manual or a set of instructions, rather it has been my experience installing and using Windows (Vista and 7), EmbroideryStudio (2 &3) and CorelDRAW (X5 & x6) in my MacBook PRO, if you are looking for that type of information, there are a few documents mentioned at the end this doc, and hundreds on the web. Boot Camp is a technology that allows booting your Mac in different operating systems, and the Assistant will guide you to convert a portion of your Mac into a full Windows PC environment; by partitioning the hard drive, installing Windows (or other OS) on that partition and use the Mac hardware as a PC taking advantage of the Intel chipsets. To use this option you have to re-boot your Mac every time you want to use Windows. Virtualization is the ability to run Windows programs within Mac OS without the need of rebooting, you are able to run EmbroideryStudio (or DecoStudio) along with CorelDRAW in a Mac and also be able to share all the Mac services (printing, network, exchange of files, etc.). As far as I know there are 4 companies that have Virtualization products: Parallels, VMware Fusion, Oracle and True Crypt. I decided to upgrade my laptop before I installed Windows on my Mac: I upgraded the HD to 1.2TB and installed 8 GB of RAM. 2 small investments that cost me less than $150! For that money the performance improvements I am now getting is worth every cent; don’t forget that you will be running 2 operating systems at the same time. I began with installing Windows Vista – just for testing purposes -, but I then upgraded both installations to Windows 7 as fast as I could, definitively Vista is not an OS I would recommend. The other different thing I did was to install both Boot Camp and Parallels in my laptop. Depending on the work I am doing I can choose to re-boot my Mac laptop to run Windows, or just run it inside Mac OS. It doesn’t matter if you are going to install Boot Camp, Fusion or Parallels, please go through Boot Camp Assistant, it will give you a comprehensive view of what is going to happen to your Mac, and you will have the chance to burn a CD/DVD or a Flash drive with the latest Windows drivers for your system. The installation of Windows is an integral part of both methods (Boot Camp and Virtualization). 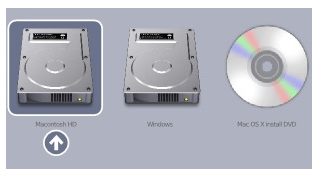 forget your Windows Product Key and have handy your Mac OS install DVD, this is sometimes useful. Run Boot Camp Assistant (under Application – Utilities) and follow the instructions on how to download updated drivers and partition your HDD. Once you have downloaded the updates and burned the DVD, your system will reboot and the installation of Windows will begin. 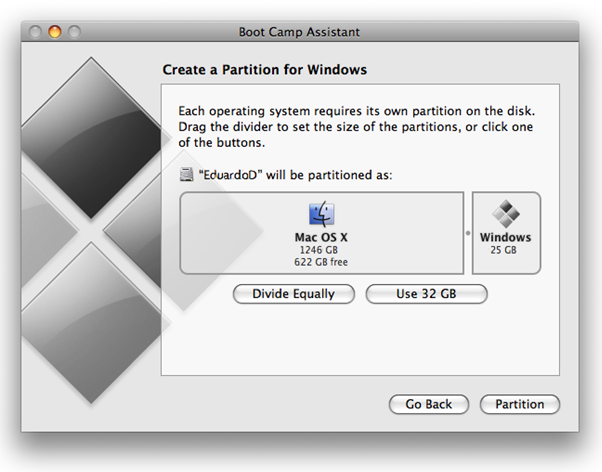 You’ll need to make a decision on how big the partitions on the hard drive will be (Mac & Win); think it through, because later on it won’t be easy to re-size those partitions and many of the software’s out there perform a destructive resizing or moving partition, meaning you will need to perform a backup or lose all the info, installations, etc. (Depends on the OS version you are running). The minimum space that you’ll have to allocate is 20 GB for a 64 bit installation (recommended). Once the installation of Windows have finished and your system is running Windows, you have to run the setup of the Boot Camp DVD (the one Assistant did for you, remember? the one that contains the latest Windows drivers for all the hardware of your Mac); if you don’t complete this step, your system will behave erratically, and the experience won’t be as smooth as it should. Once you finished this step, and as with any other Windows installation, run Windows update, and let Windows download and install all necessary updates, reboot and you are ready to install your Wilcom software and CorelDRAW. Boot Camp will install an applet that will be available through the Control Panel for selecting boot options and operating systems. Both installations of the commercial virtualization products available (Fusion and Parallels) are easy and clear, and you are going to follow similar steps as with the installation of Boot Camp, you will need your Windows Install disk and Product key and be connected to the internet, but the size of the virtual disk partition (the space you will allocate to install Windows) is not as important as in Boot Camp and it is quite easy to resize it in the future. I will strongly suggest that you use the DVD you burnt with Boot Camp Assistant (the drivers section) to update your Windows even under virtualization (Parallels or Fusion). Test your Windows OS to be sure that all the drivers are working properly (display, network, mouse, keyboard, etc.) 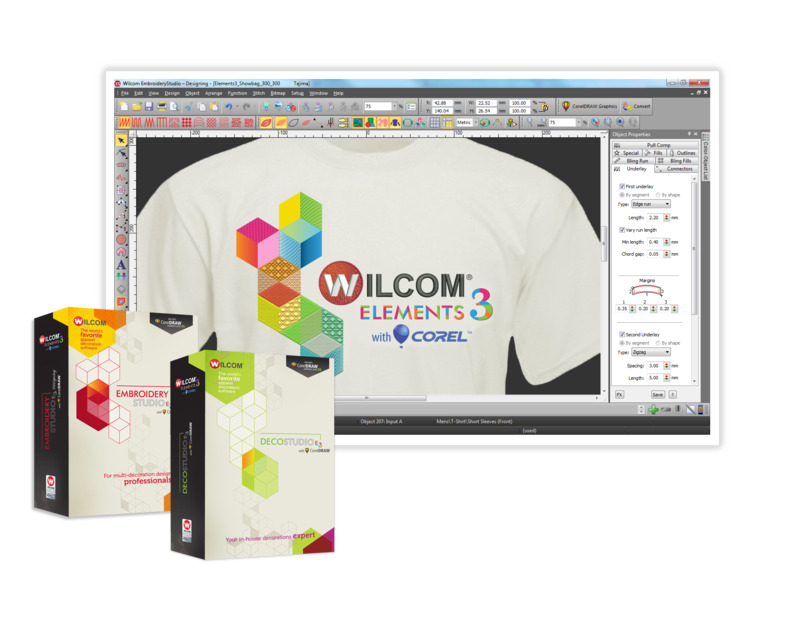 If everything is fine you are ready to install the Wilcom software (and CorelDRAW) in the same manner as you are used to, you won’t find any difference, and voilà you’re done! Difficult question… they are almost identical in performance, compatibility (Lion, Windows 8) and UI (you can see Windows in full screen, or better you will see EmbroideryStudio running as a Mac application – meaning you won’t see Windows running). The benchmarks I have seen put them in a “nose to nose finish”, and the winner has been the one –that at that specific moment- has the most updated version… maybe the only difference is pricing, Fusion today is 25% cheaper than Parallels. Although I found out that the performance of the newest versions of Parallels and Fusion are quite good, the performance of Windows (and subsequently ES and DRAW) running under Boot Camp is much better, but on the other side, (using virtualization), the fact that you can exchange files between Windows and Mac OS seamlessly and the ability to use all the Windows and Mac applications (that you are so familiar with), is priceless; so choosing which method you will use it’s a question of personal taste, usability and productivity. Personally, I love the fact that have the option to choose between the two anytime. Last but not least, all of these procedures and products allow you not only to install Windows, but also other OS like Linux or UNIX, or multiple versions of Mac OS or Windows. If you have trouble with your partitions, or if you need to resize the ones you setup, one of the best Apps out there is iPartition, it is easy to understand and all the processes are done within a graphic environment, and for most of the processes they have non-destructive resizing and moving. If you have trouble reading /installing hard drives in your Mac, (to exchange files between the Windows partition under Boot Camp and Mac OS) be aware that Mac OS can’t see NTFS file systems, the easiest way is to re-format your external HD to any variation of Fat (Fat 32 or ExFat). You can do this from within Mac Os (Disk Utility –under Applications, Utilities: click on the drive and select Erase – Format) or within Windows (Windows Explorer, right click on the drive, Format, File System). The other way to do this is installing a 3rd party application that will allow you to “see” the NTFS file system under Mac, I used an App developed by a Canadian company called Tuxera that offers an NFTS viewer for Mac. *Please note: research current as of February 2013. This is an independent review only. Wilcom does not provide technical support on hardware devices. 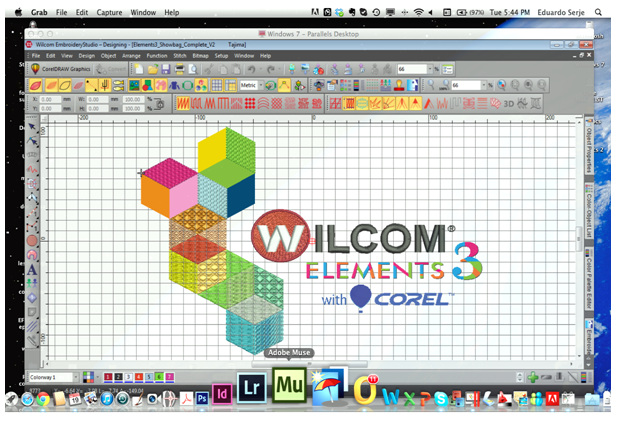 Eduardo Serje is product manager for the Wilcom Elements product suite, which includes DecoStudio and EmbroideryStudio. Eduardo is a strategic thinker, well known in the apparel decoration industry and is recognized as one of the world’s top CorelDRAW users. We recently got a chance to catch up with Steve from Hand & Lock – world-famous embroiderers and Wilcom customers. Based in London, England, Hand & Lock produce bespoke embroidery for a diverse range of illustrious clients including the Royal Family and fashion brands such as Louis Vuitton, Burberry, Chanel and Stella McCartney. As a traditional embroidery company, their heritage reaches back to Roman times and as such, they have become world renowned as providers of the finest hand embroidery. They are a living antique, but moving with the times, bringing hand embroidery into the present. We asked Hand & Lock what they had to say about their work, methods and why they are so passionate about their Prize for Embroidery Design. 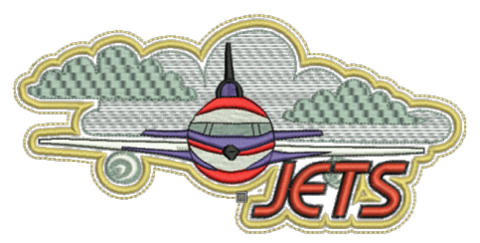 Q: What made you choose Wilcom as your embroidery digitizing software? 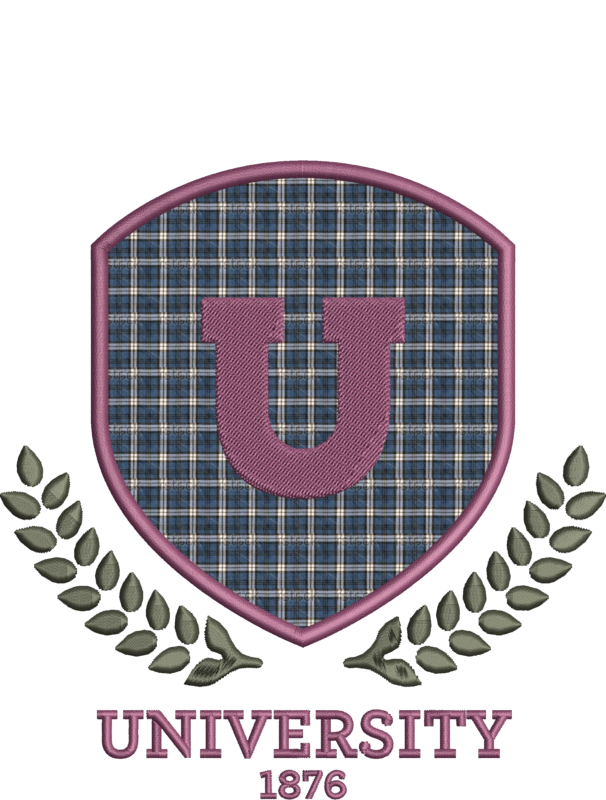 Q: Although hand embroidery is your main specialty, can you give us some interesting examples of work you’ve done using our software to create your machine embroidery? Q: Wilcom are now proud sponsors of the Hand & Lock Prize for Embroidery Design. It has been running for over a decade now, how do you feel it has impacted the world of embroidery and what are your future plans for it? 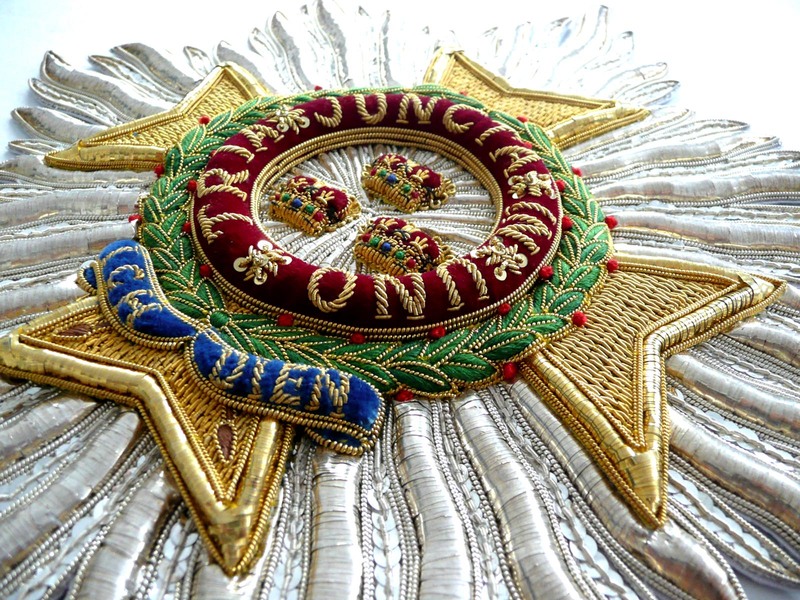 The Hand & Lock Prize for Embroidery commenced life in 2000. It was initially aimed at students, however in 2009, an open category was added to great success. 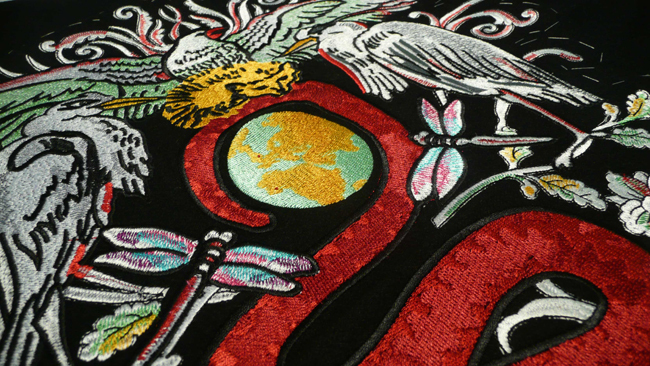 The prize is distributed to over 1000 colleges and universities throughout the world and has become the world’s premier embroidery prize with entrants from hundreds of different countries, universities and colleges and is rapidly growing each year. This year’s prize is open to both students and anyone with the passion and flair for embroidery. For details and to enter, visit the website The Hand & Lock Prize for Embroidery 2013. Entries close 31st March 2013. Connect with Hand & Lock on Facebook or visit their website. I’ve noticed a lot of people looking for information about how to design for 3D Foam embroidery or 3D Puff. At the ISS Long Beach show this was a very popular technique, and I’ve noticed it alot in retail fashion stores. This is a great way to attract new business and add some pizzazz to sports wear and fashion pieces. If you’re not sure how to do it, below are some simple instructions from the Wilcom Support website. The instructions are based on Wilcom EmbroideryStudio. 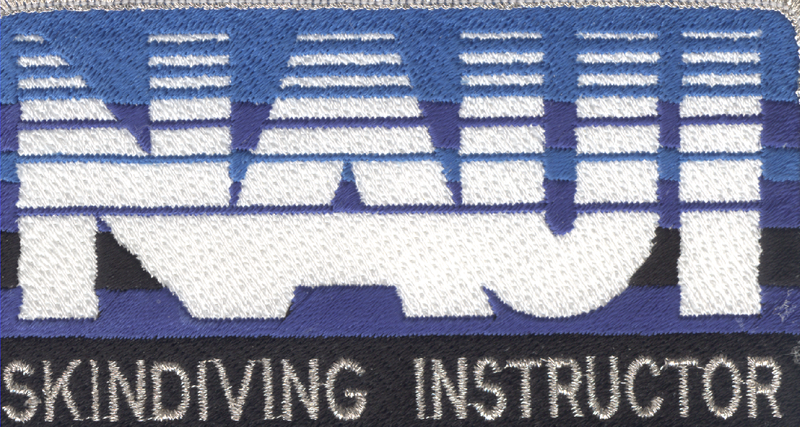 The digitizing technique for 3D Foam is in similar to digitizing for appliqué, as placement guide, tack and cover stitching are needed. The main difference is that the cover stitch is also used to cut the foam, and therefore is usually a high-density Satin stitch. It is very important to choose a suitable foam material for your job. Remember that the excess foam has to be removed after the stitch-out. If the foam is too stiff and strong, it can be difficult to remove and you can even damage the embroidery. Choose a foam whose color is as close to the embroidery thread color as possible, or at least not contrasting. Also consider whether the foam is washable. Most 3D Foam embroidery is done on caps, as these are not washed very often. Digitize a travel run placement guide just inside the boundary of the shape, followed by a Stop, and optionally a Frame Out. Place the foam over the area. Using short (1.7mm) Run stitches, tack the foam down. Any “open-ends” will need to be closed first by digitizing a narrow column across them (see illustration). This will help to cut the foam at the ends and keep the foam from poking out or lifting the end cover stitches. Next lay an “underlay” with Zigzag, stitch spacing of 1.5 – 2.0 mm, to help with holding down, cutting and covering the foam. Lastly is the Satin cover, whose density should be increased by 40- 60% above normal. This will vary depending on the thickness of the embroidery thread used, and the height and color contrast of the foam. Typical Satin density should be 0.2 – 0.4mm, with Auto Spacing Off. The Pull Compensation should be increased to 0.3mm-0.5mm according to thickness of the foam used. Any column overlaps should be at least 3 stitches to prevent the foam pushing through and creating a gap. Make sure your Tie-off stitches are secure. You could even use a 4-6 Run stitches of 1mm. Thread tension should be loosened for the cover stitching to help the thread over the raised foam. Some foam suppliers recommend a ballpoint needle because it creates larger holes in the foam, making its removal easier.